I am an Accountant by profession with a passion of teaching. I have a BS in Accounting from Bentley University as well as MBA from University of Massachusetts. Currently, I am working as Senior Accountant in a leading multinational construction company. In the past, I have worked as an Inventory Accountant in an oil corporation, a Staff Accountant in the Accounting Department of a multinational ESL company and a national construction company. College Level Accounting / Math tutor - Helped students with their homework and class projects. Introduced use of Excel and different software to complete work efficiently. Taught different strategies of learning and understanding for educational success. ESL Help - Worked in Bentley as conversation partner and as a Teacher Assistant in Adult Education Center of Waltham. In both positions, I worked directly with foreign individuals to teach them English as well as introduce them to cultural norms and etiquette while helping with transition. High School / All Math Subjects - I was also a Math tutor for a high school senior. He was senior in High school and failed his math course. School offered him to re-take the exam within one month period in order to pass high school. I helped him prepare for his math exam and he passed it with 85% marks. This helped him getting his GED and get into a college. Middle School / All Subjects - I was an in-home tutor for a 6th grade student. I helped him with his classwork and homework for all courses while he was away from school so that he don't miss any work while he was away. He was able to join his class from the next day of his arrival in school, as I helped him prepare for all the missing course work. I am working in a multinational company as Staff Accountant, where I develop processes in the Finance department as well as report financials. I have my BS in Accounting from Bentley and working on my MBA with Concentration in Accounting. As an accounting professional, I am always working with Excel where I prepare different models and templates to make day to day work easy. I have prepared Financial Statements, financial analysis, budgets, forecasts, and other accounting tasks. Excellent Tutor! Highly recommend ... 5 Stars! My son has been tutored by Adeel since mid- September on a very regular basis, and he has shown himself to be patient, resourceful, polite and excellent at what he does. Adeel takes pride in his work and the results have been spectacular! Thank you Adeel!! Adeel was amazing, he was able to show me a better way to my answers in Excel and how to get the right formula. The way the book teaches us to get the correct answer is okay, but his way made more sense. 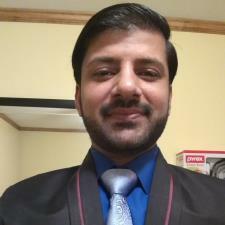 I have had multiple tutoring sessions in accounting and financial management from Adeel. He is exceptionally knowledgeable in the respective subjects and excel. He has a great demeanor and is very patient with my slow ability to grasp concepts. He has helped me tremendously. Definitely recommend him!! Adeel helped me understand accounting much better than what I was getting from my classes. I liked the way he broke down each individual problem and made it so I could understand. Never once did he ever make me feel insecure about material. He was very patient and did not mind repeating it until I understood. I so recommend him to anyone because I was very skeptical about doing online tutoring since my classes are online and I struggle a little bit with them. The best person to help for accounting questions!! Adeel helped me breakdown and understand accounting like no one else ever could. This is the person you need to turn too if you need tutoring in this field. I'm walking away more confident than ever. I will be using him more in the future. As a recent MBA graduate, Adeel understand the material and was helpful on financial accounting questions. Based off of our one session I would recommend. Adeel was AWESOME. He knows his stuff. I would highly recommend him for anyone needing Accounting help. He gets an A+++ in my book. Next time I need a tutor, he will definitely be the one I will be seeking. Thank you sooo much Adeel for a superb job. Great lesson, accurate, honest, knowledgeable, to the point, no time, wasted, great teacher....very satisfied with this lesson......!!!! Very very Highly recommended!! Adeel I. helped me find a faster way to do my work and helped me understand it more, he has made homework easier. Adeel truly understands my assignment and worked quickly to help me. He knows excel and worked through the formulas with ease while explaining them to me and how they work.